So nerds ARE capable of reproduction! So instead of Dungeons and Dragons was it Pyramids and Sphinxes? DO NOT ROLL IT! THE ANCIENT MAGICS WILL BE UNLEASHED! "You are on the east bank of the Nile. You hear a rustling sound behind you. Roll initiative." Where can we get a replica? DO ROLL IT! THE ANCIENT MAGICS WILL BE UNLEASHED! Hell yeah geeks have ancient precedent! I now imagine some eccentric billionaire buying it for his D&D campaign. The mage in your party passed the Knowledge Arcane check. He tells you that it would still be Dungeons and Dragons, or more like Tombs and Dragons. The ancient Egyptians had allot of Dragons too. They even had their own mythology featuring them like Apep, the dragon/snake that lay in wait to attempt to kill Horus every time he died and had to pass through the underworld, which was everyday at sunset. They explained the Red colour of the sun rising at dusk as the blood of that dragon being wounded and retreating. Neat! From what I can remember from a couple books I read, the Ancient Egyptians were big on games. Ever seen Yu-Gi-Oh? How could a children's dice game have such historical significance? Twenty bucks says Thinkgeek will have a replica of this for sale within six months. It appears that you're getting mind-flayed by a giant cthulusphinx. Oooooooh, you landed on lambda? So wait, the Egyptians were into D&D back then? Awesome! What's next? They will find a tabletop game and some figures to go alongside it? So wait, the Egyptians were in D&D back then? Awesome! That would be freaking awesome! and if not, I'm sure some brilliant artist/ carpenter will build some to go with it. I hope so. Or Chessex. Someone needs to make a replica, because I WANT IT! It's the Knucklebone of Fickle Fortune!!!! It'd be hilarious if it turns out that this was used to determine who they were going to kill each day. Number 4, please step up here! I wonder if the default shape of an Egyptian die is a D20. 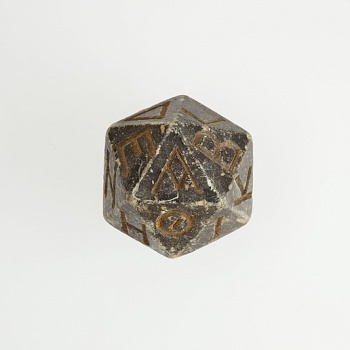 The modern die is usually a D6 but ancient cultures could have had entirely different norms. Astonishingly, the Ancient Egyptians, much like us, had a base 10 number system but their regular dice tended to not be a whole lot different. In the spoiler is an example of ancient Egyptian dice but it could also be a modern kid's work. The Sumer culture around 3000 BC already had dice practically looking like ours, even with the eye thing where the opposing sides add up to 7. But they had a base 6 number system so it'd be the most reasonable thing to invent a 6-sided die. Another fun fact: the oldest non-"regular" die ever found is from about 2600 BC, Sumer as well and is actually a d4. Aaaaand I'm still going! At around 1500 BC in India they started to independently from the Sumers develop dice for ritual and casual gaming where they used the nuts of the beleric tree, which are five-sided. This is also referenced in the Indian epic Mahabharata. And in another Indian epic, the Jataka, written around 400 BC, they refer to the use of four-sided dice. A D20 in ancient Egypt? I'm not saying it was aliens. So nerds are an ancient race? I KNEW I WAS DIFFERENT! but I like to think those jerks are just in the back room during lunch breaks trying to roll natural kappas in their ongoing game of Sarcophagi and Sphinxes. That made me actually laugh, so you get a cookie. Jokes aside I wonder what was around it? If they actually knew what game it was from it could even kick off a new gaming trend in the modern world. Well I'm obviously a descendant of the ancient Egyptians. What? I'm pretty sure the sun doesn't rise at dusk. You mean dawn right? Who wants to bet that thing's weighted? Rolln' omegas all day long! The thing about "Egyptian Dragons" is more often then not they're serpents, sure the ones with wings could be considered dragons but more then anything they're winged serpents. Also if you look at images of most Egyptian Gods that could be considered dragons they don't really look like dragons, some look like cats and some look like straight up snakes. Must plan museum heist now. The groans from this have left so many voices Horus. I laughed so hard I may have to set an appointment with my cairopractor. Heh, some actually not terrible puns cropping up. One thing is for sure: this definitely proves 'prior art' against WotC claim to own everything role playing and card related, ever. Ok, now I confirm the critical with my vorpal khophesh on the Canaanite, killing him. How much XP is he worth again?